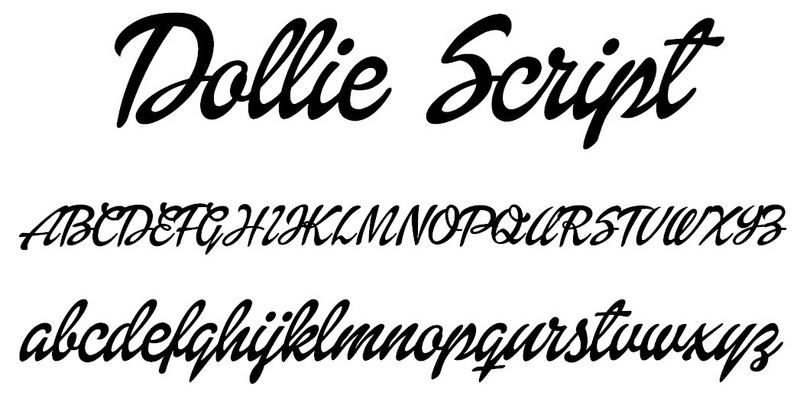 This is a collection of just some of our popular fonts. Some designs do use fonts not shown here (yet). In theory, we can print in any font. 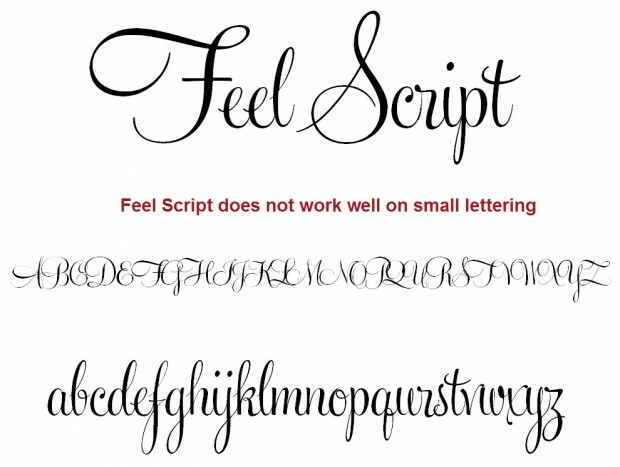 In reality, thin fonts are not as robust as thick fonts, and thin (particularly thin cursive) fonts may not always be robust enough to even go through the production process. Any font shown here is safe to use. And keep in mind we can (and do usually) stretch letters in height or width to be a little wider or narrower to fit in the space you have. This entry was posted in Uncategorized on March 30, 2014 by wp_admin. How long does it typically take for my order to ship? 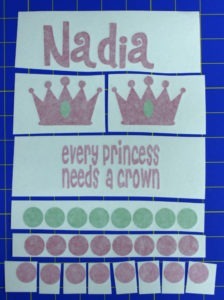 Vinyl decals: Except in unusual circumstances like illness or vacation, you should receive a proof via email within about one business day of your order. If you like it, please respond with printing approval, or ask for changes. We generally print and ship within a business day of receiving printing approval. If you do not respond to us, either asking for changes or approving printing, we will wait about 7-10 days, then print and ship (Why we do that.). Do you know why FAQs are long? There is always a story behind most of them. I am adding this note because of one of those special moments! Please note - Express shipping does not change our process: You order, we send a proof, you approve or ask for changes, we print and ship. Express shipping just changes how we ship the package to you. Express (1-2 day delivery) versus First Class (3+ day delivery) mail. I know Express mail is $25. It is not a work-weekends-and-cancel-vacations rush fee. $22 of it goes to the post office. $1.25 goes to the credit card company. That leaves $1.75 for me, but even that I don't really get. Occasionally the post office doesn't deliver Express mail in 1-2 days and you ask me for a refund. I don't get a refund from the post office. And occasionally for whatever reason I have to send a followup package and I have to cover that. So please understand that the $25 is not a rush fee and please do not yell at me that I didn't work a weekend or come back from vacation early after you paid it. It is just paying the post office for quicker delivery. It is very typical for orders to ship the next business day after the order is placed. You order at Noon. I send a proof by that evening. You approve printing by the next morning. It ships later that day. How long is the shipping transient time? This entry was posted in Uncategorized on March 29, 2014 by wp_admin. 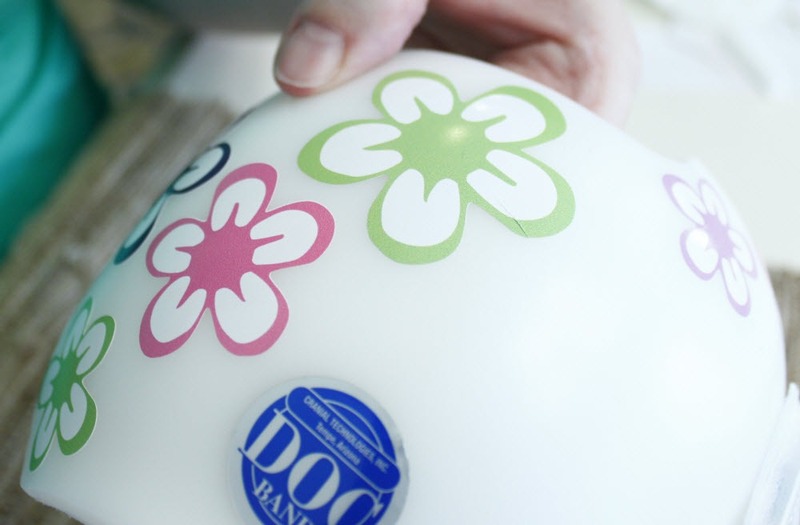 We recommend sealing the decals with Mod Podge and we have a Mod Podge application guide. 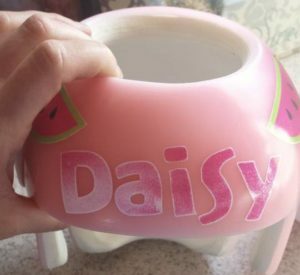 While the decals stick well to the slick, non-porous band, they are susceptible to scratching of the ink, pushing on thin decal parts, and corners and points can catch on fabric enough to start pulling up the edges. With children beyond the baby stage, this can happen in a few days! This is generally a much bigger issue with older children who are very active movers but with as easy as it is to put on and take off, we strongly recommend it for all bands. If you don't use it but needed too, the decals can be damaged before you realize it. Mod Podge can help with large decals applied to curvature. 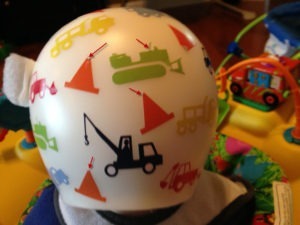 The large decals can experience stress that is encouraging them to pop off. Mod Podge can be hardly noticeable. 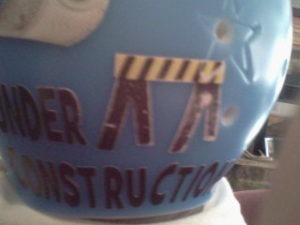 Most of the helmets in our cranial band picture gallery have Mod Podge applied, and you can't see it in the pictures. 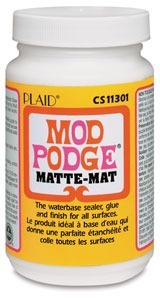 Mod Podge protects against scratching, and significantly helps reduce pulling on the thin decals and catching on fabric. The pictures below show the issues. Decals on the back of active kid's helmets need Mod Podge! 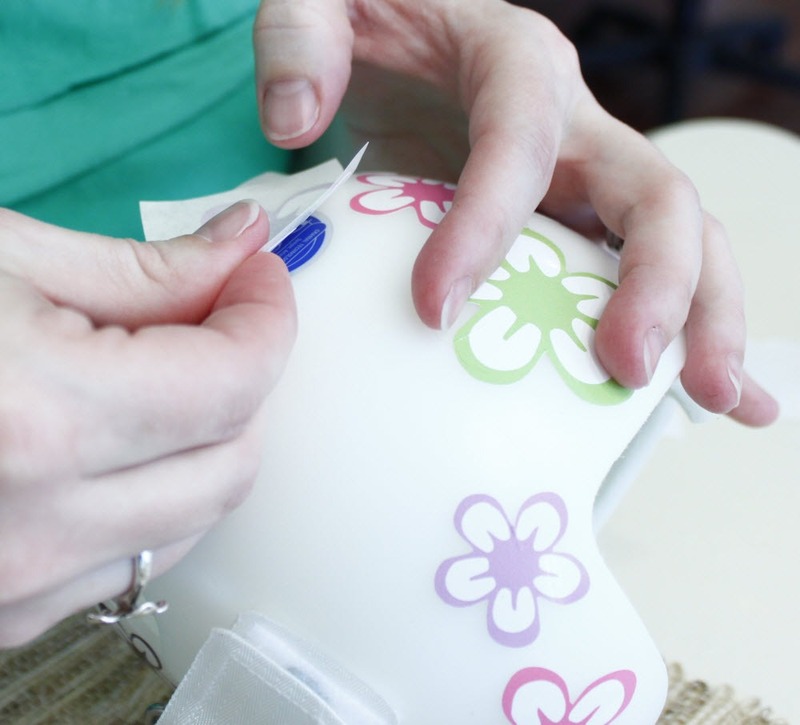 This image shows the classic case of a helmet being rubbed on fabric. The fabric catches on the corners of the letters, eventually lifting them up. But the rounded edges of the clouds don't catch (yet!) and are fine. Mod Podge can help this. This image shows how points and thin sections fair when exposed to rubbing. The points break off, and the thin parts shift and break off. 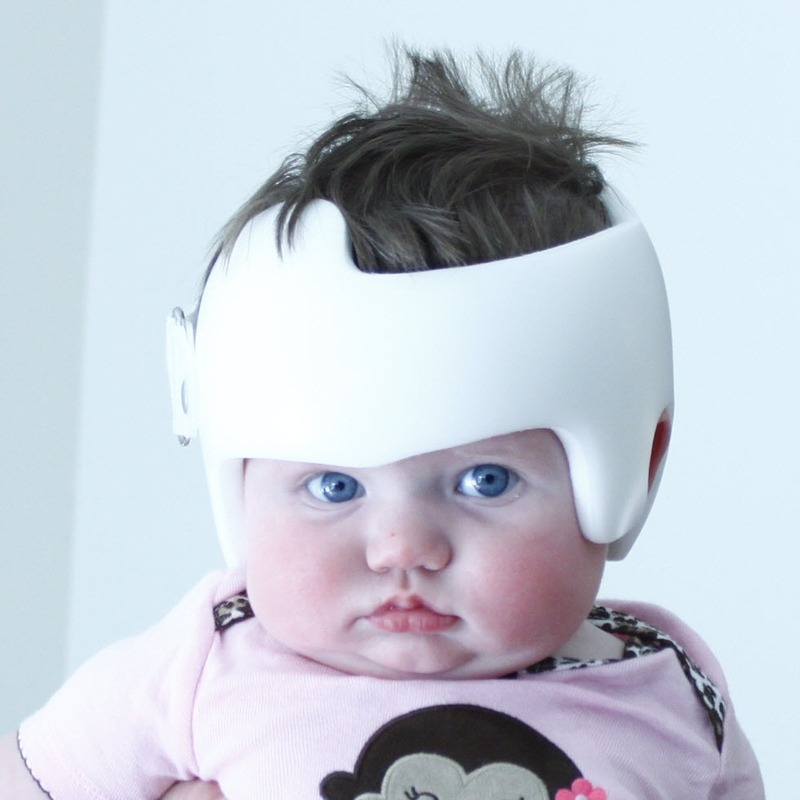 Rubbing is generally most significant on the back of the helmet because young children lay on their backs. 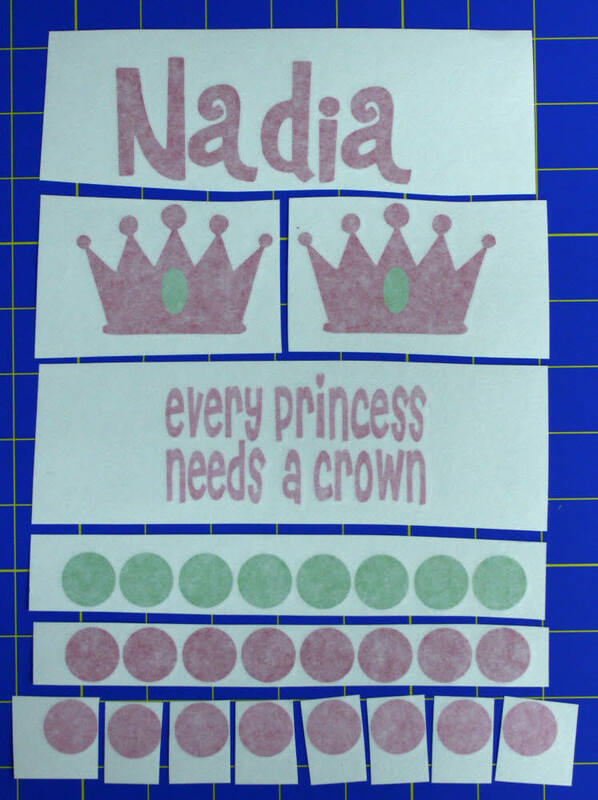 Mod Podge protects decals that don't have sharp points and aren't thin as well from abrasion wear. This images shows this little girl is active on her tummy as the name is worn, but the side decals are not. We recommend five medium coats of Mod Podge, and periodic application (every other week or so on the back of active children's helmets). The mod podge is thick enough when your fingernail slides over the edge of the decal, and does not catch on the edge. We recommend an initial light sanding with the included sandpaper, and then apply two coats on per day, the first two before your child wears the band, and two more the next day, and the final coat the day after. This should fit the one hour per day your child is allowed to be bandless. The initial sanding is just a light one, but all the surface of the band should be roughened. This insures that the mod podge will bond with the band surface. When applied to the proper thickness, Mod Podge removes easily. Work and edge of the Mod Podge until it can be lifted up, and then it will pull off in large sheets. The Mod Podge will remove without damaging the decals. What do moms and dads say about using mod podge? This entry was posted in Uncategorized on March 24, 2014 by wp_admin. If you sealed the decals with Mod Podge to the proper thickness (I hope you did! ), removing it is a snap! Use your fingernail and start at the edge of the Mod Podge, and work it until you can start to pull on the Mod Podge, and then it will remove in nice big sheets. It is even easier than removing the decals themselves! If the mod podge is not thick enough to come up in sheets, or it is very dry and brittle, take a wet washcloth and rub the surface of the band for a minute or two. Then dig at the mod podge and then it will come up. Our decals are easy to apply, and easy to remove. Cheap stickers are weak and will tear and shred rather than just come off. Our decals are strong. Use your finger nail to get under an edge of the decal, and work it free till you can grasp it. Then pull up and back slowly, working it back and forth, and the decal will come free. The decal may leave some adhesive you can feel with a finger, but a little rubbing alcohol will remove that. This entry was posted in Uncategorized on March 16, 2014 by wp_admin. Can I make changes to the decals? Yes! You can request color changes, change sizing to fit your band, make changes to the text in a design, add text to a design, change the font in a design, mirror an element in a design, mix and match elements in a design. Just use the special instruction box and request the changes. The more you buy, the lower the price of EACH decal! The shopping cart will apply the discounts as the decals are added to the cart. I can tell you what our decals look like, or just show you! Our decals are first full-color printed onto a 30 inch wide roll of white vinyl, the same vinyl you see on cars. 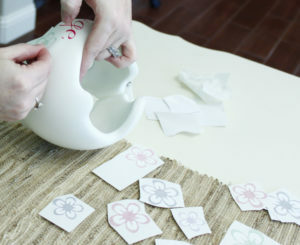 After printing, the decals are cut to shape with a razor blade. We then remove the excess vinyl, and apply transfer tape which enables you to apply the decals to any clean, dry, smooth surface that for the most part only bends in one direction. They are also easy to remove. 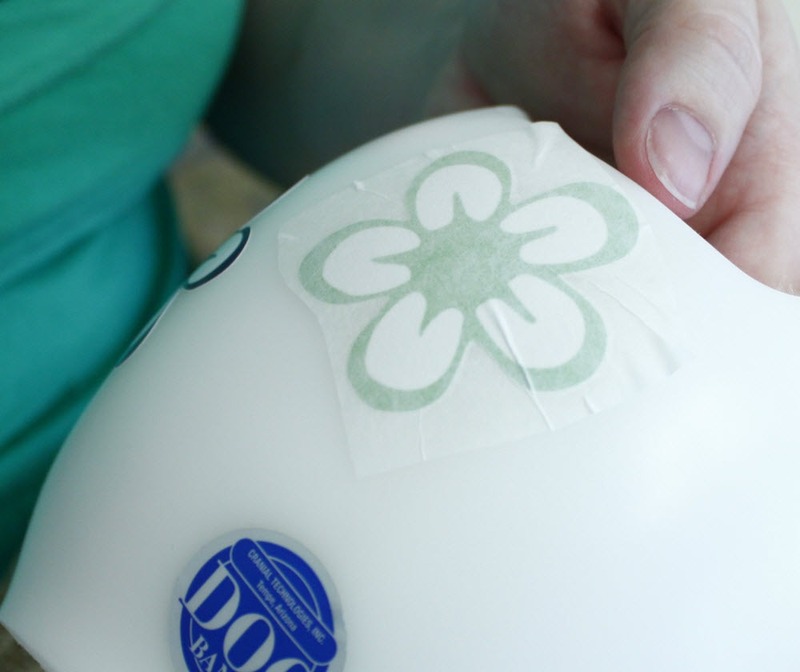 We STRONGLY recommend Mod Podge to protect the decals. What does it mean to only bend in one direction? A cylinder is a good example. An example of something that bends in more than one direction is a bowling ball. Big, dense decals can have trouble on a bowling ball because the vinyl bunches up in the ‘corners’ where the vinyl doesn't have anywhere to go. Because we full color print, we can generally achieve just about any color, and we don’t ask customers to layer vinyl. Fortunately, helmets usually have ample locations suitable for decals. Our vinyl is safe to go outside, and sticks well. We are frequently asked how long a decal will last, and that is a hard question to answer for several reasons. Normally if the decal is stuck well to a clean, dry smooth surface, then it will last a very long time just like a car bumper sticker. But designs with thin parts (think thin cursive writing for example) are more prone to damage due to rubbing. Second, a relatively large decal stuck on a surface that bends in two directions, internal stress may tend to pop the designs off. Third, you then attach them to an active child that rubs it on things . . . 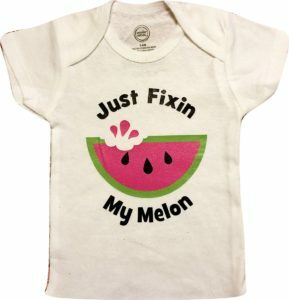 Thus, if you have a design that you would like to have last for a very long time on any child older than a young baby, we STRONGLY recommend Mod Podge. 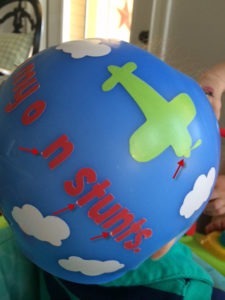 Active children can damage some decals within a few days if they are not protected. We have never heard a report of decal damage from anyone who followed the Mod Podge application instructions. Another solution is to take advantage of our volume discounts and order a couple of designs, and change them out at your leisure! 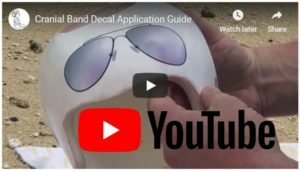 The decal application instructions are also on YouTube! Paige and her mom and dad recently stopped by so I could take pictures for a step-by-step guide on applying our high quality decals to baby helmets. We have instructions to how to remove the decals as well. A shameless plug for our apparel collection! Your vinyl decals will come with transfer tape already applied to the front of the letters. The transfer tape, which is sticky and transparent, allows you to lift the vinyl decal off of its backing and transfer it to your child’s band. Step 0 - are you painting your helmet? Please pop over to our painting guide! Step 1 - separate the sheet of decals into each element. This will make applying them much easier. You can cut close to the decal on some sides, but leave a smidgen of space so you don't cut into the decals. It helps to cut larger decals closely to minimize the excess transfer tape. The transfer tape does not flex as easily as the decal when bending around curvature. Step 2 - Either a) clean the outside of the baby helmet with rubbing alcohol, or b) I have started including a small square of sandpaper in orders. Please sand your band everywhere you expect to apply decals. You are not trying to dig to china, just to firmly roughen the surface. You should rub firmly enough that you feel some heat. A good band sanding should take about 5 minutes. A few customers have had issues with getting the Mod Podge to stick to the band even with the rubbing alcohol bath. Since it is easy, why take the chance? Step 3a - added from customer feedback. Some decals are larger and need to be centered on the band. Use a pencil to mark the center line of the band to help you get them on straight. Step 3b - Pick a small element that you have more of to start. It only takes a little practice to get adept at this, so the first element you try is the most likely you will make a mistake on. From one edge, slowly peel the transfer tape (the masking tape like material) from the backing (the slick stuff). The decal should stick to the transfer tape. Watch where the separation is happening, to make sure everything sticks to the transfer tape. 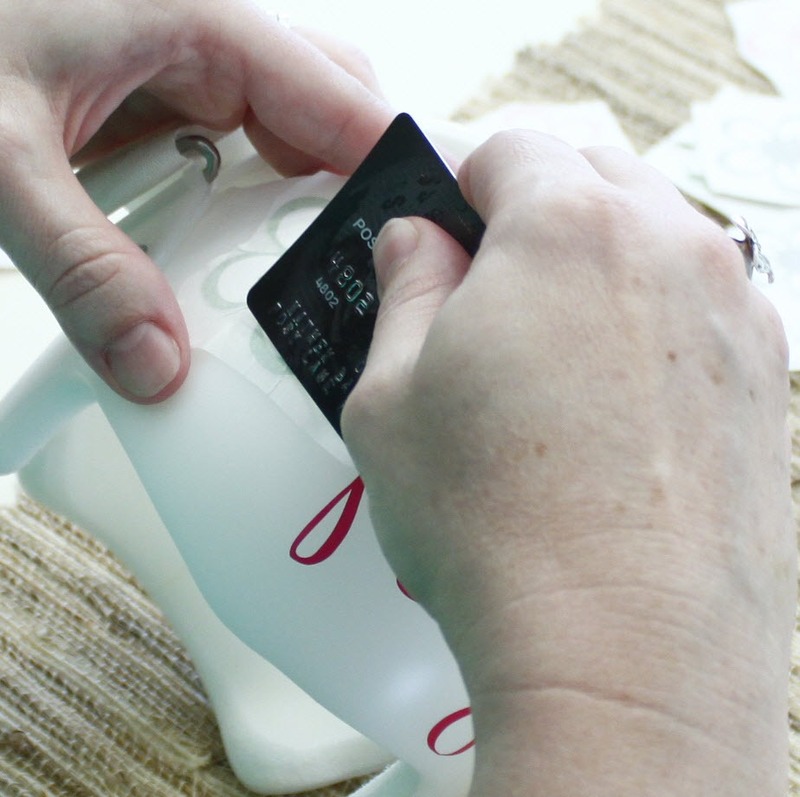 If something is not sticking to the transfer tape, you can stick the sides together and rub the transfer tape (a credit card works well) until the vinyl sticks to the transfer tape side. Step 4 - Slowly stick the decal down. Start at one spot, and from there use your fingers to stick the decal down completely. Watch for bubbles or creases. If you have a bubble or crease, see if it is possible to lift up the vinyl to release. If not, use a credit card or squeegee to work it out. Slowly lay down the decal onto the band. Step 5 - A vinyl decal may appear to be stuck down firmly with just your fingers, but if possible, it really needs more pressure to firmly bond. Mom started with fingers, and finished with a credit card to bed the vinyl. Step 6 - pull back the transfer tape and slowly remove. Mom demonstrates the correct method for this. Pull back slowly, not up, and watch the edge. If vinyl still wants to lift, pull the tape back over, and use fingers and a credit card to firmly stick down the vinyl. Then pull the tape off again. Step 7 - Here is a boo-boo. A crease got put into this flower. We then demo what can be done about it, if the vinyl got stuck down too firmly to lift it off and release the crease. Mom worked this crease out a little with the transfer tape still on, but it is easier to work a crease or bubble out with the tape removed. Here mom works the crease with a credit card. Using the squeegee you can get fairly aggressive with the vinyl, as it is tough. You can apply the decals with a credit card, but a blue squeegee makes the job easier. The squeegee is easier to grip, more flexible, and softer. The credit card can want to 'dig in' the vinyl, instead of sliding, while the squeegee likes to slide. *** Note from an unhappy customer - credit cards can have sharp edges and credit cards can actually scrape/cut off the printing. The advantages of the squeegee become most apparent in this case. In this case the vinyl was so firmly stuck down before the crease was spotted, the crease could not be completely removed, but it is nearly invisible. 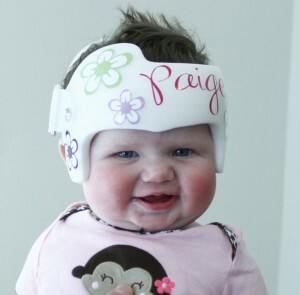 The experience was very enjoyable for mom, and Paige was a happier baby for it. With a decorated band Paige is now a happy camper! But my design has big decals like goggles or glasses! 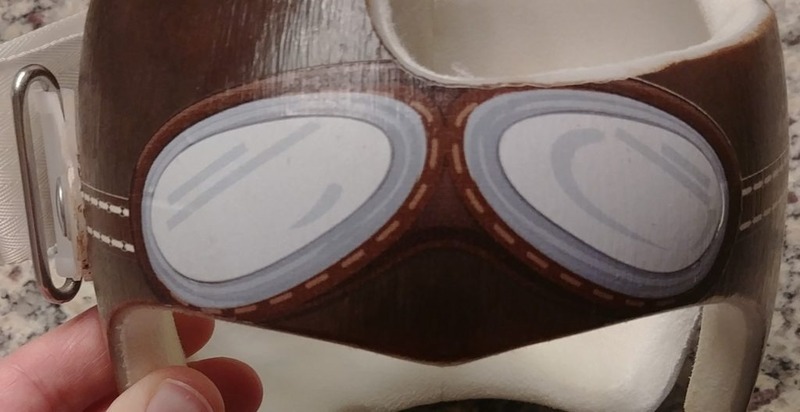 If your design has goggles or glasses (or other large decals), please see our special application guide for goggles and glasses. A great customer photo example of a goggles applied flat! Your band looks fantastic! I have a page of tips from experienced parents on how to clean the band and eliminate band smells. Quick note - washing mod podge with high percentage rubbing alcohol can damage the protective coating and is not needed. Why do we recommend you Apply Mod Podge? The #1 enemy of vinyl decals is friction. Run your fingernail along the band until you get to the decal. Feel the edge? Keep pulling, and eventually you will get the edge of the decal to lift. Active children are rubbing their heads on bedding, rugs, and furniture, and fabric rubbing on the decals, over time, is just like your fingernail, pulling and tugging on the decal edges. We have had very few reports of damaged decals from folks who followed the Mod Podge application instructions (and we have been able to find a solution for them at no cost to them). We recommend you apply about five medium coats of “Mod Podge” as a sealer over the top of your decals and we have a Mod Podge application guide as mentioned above. You have enough Mod Podge thickness when your fingernail keeps sliding and does not catch on the decal edge. Not every design and child needs this, but most of the time you won’t know until it is too late. Reapplication every few weeks may be needed with active children. We recommend two coats at the time of initial decal application, two more the next day during the time your child is not wearing the band, and one last coat the day after. 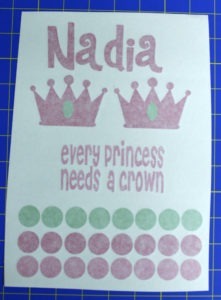 Designs and lettering with thin or pointy parts (like the name Paige above or see the pictures below) are prime candidates for Mod Podge, as just a little rubbing will lift or shift the thin lettering, break off corners, or can even rub the ink off. Without Mod Podge, damage happens fastest with active children who move more, and the damage will usually happen first on the back of the helmet where the rubbing generally happens most. Damage to unprotected decals can happen from just a few days to a few months. 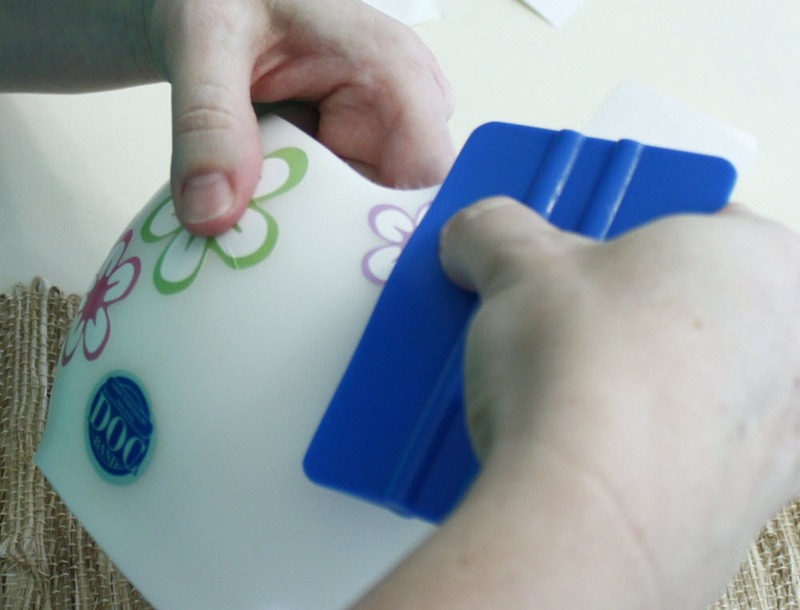 Mod Podge is great at addressing each of the issues - it reduces pulling at the edge of the decal, protects the top of the decal from wear, and helps lock small parts in place! Mod Podge is very safe and Non-Toxic. Please use the brush on Mod Podge (matte finish) and NOT the aerosol Mod Podge, our outdoor Mod Podge. 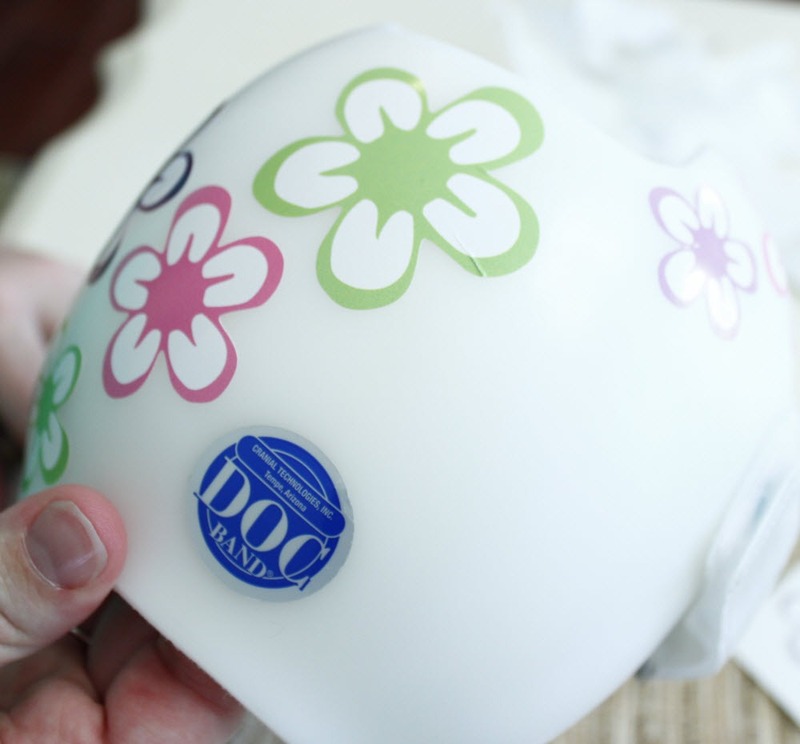 We recommend you put two coats on per day, the first two right after you apply the decals and before your child wears the band, and two more the next day, and the final coat the day after. This should fit the one hour per day your child is allowed to be bandless. You may want to reapply the Mod Podge every other week or as needed. 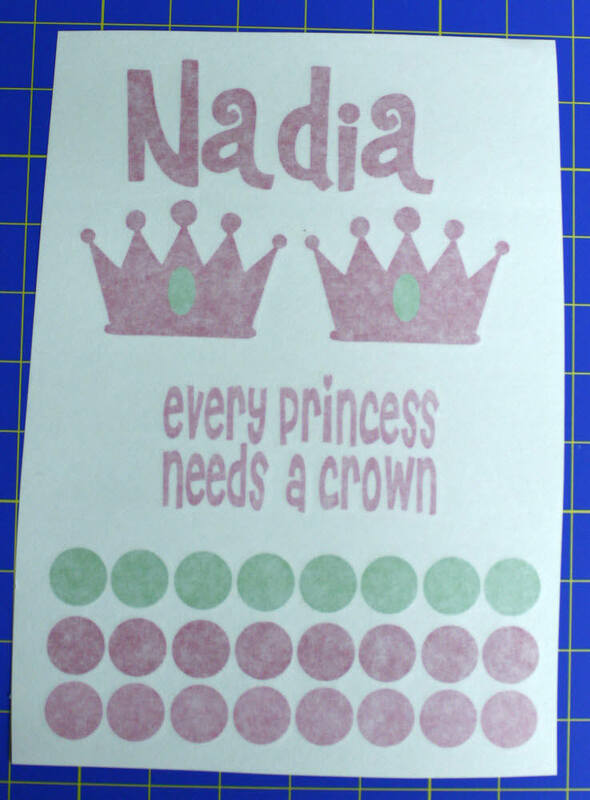 If you would like to change the design, Mod Podge is easy to remove when applied to the proper thickness. Work an edge with your fingernail until it starts to lift up, and then you can pull it off in sheets. Our decal price is for a roughly 8.5” x 11” sheet of color printed vinyl, cut to shape decals like in these pictures. We have an instruction guide on how to apply them, remove them, we recommend Mod Podge to protect them, and we offer volume discounts. In many designs we offer a name in the font shown or change the font. After you order, you will get a proof by email within about one business day that will show the design and the sizes of the larger design elements. If you do not receive a proof within two business days of placing your order, please check your spam folder, and if you don't see the proof in there, please email us at info@blingyourband.com to check. We will alter colors as needed, change sizing, add text, change fonts, mix and match elements, and mirror elements. Please use the special instructions box for these requests. The images on the order sheet might show a lot of blank space. We will fill the blank space with extra design elements from your design. This is a great source of replacements should your child rub something off. After you receive the proof, and are satisfied, you must send an email expressly approving printing (see next paragraph). After we send a proof, if we don't hear from you for about 7 days, we will follow up asking if you are ready to print. If we still don't hear from you after about 7 days, we will print and ship. We have gone to this procedure because a number of folks email after a few weeks demanding to know if their order has shipped. This entry was posted in Uncategorized on March 14, 2014 by wp_admin. FishPig's Magento WordPress Integration extension allows you to create keyword rich blogs using WordPress and display them via Magento, saving you time and money. This is great for SEO as WordPress contains tons of search engine friendly features but is also great for your users. WordPress, unlike Magento, makes content management painless, encouraging you to write great content rich blogs, which will keep your customers interested. If you need help with the extension, check out the documentation. If you want to further enhance your blogging experience, check out the list of Magento extensions that are add-ons for WordPress Integration. We now also offer a Magento full page cache extension that works on any server and canincrease the speed of your site by 400%! This entry was posted in Uncategorized on March 13, 2014 by wp_admin.